I wish there is any english translation. Thanks. Maybe some english instructions? 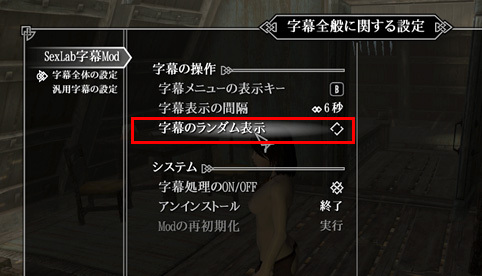 I don't have english instructions for this mod. thanks for contact me. How many lines of subtitles can be in one "import_stage"??? Order of lines in a stage is not random? Right. But I plan to add the random mode in the next version. That is good. Looking forward for this version. Please replace them with your own files. 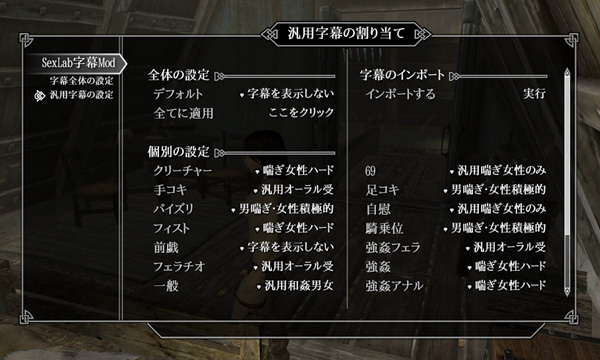 Please Select "Random mode" on the first page of the MCM menu. SORRY, I AM FROM TAIWAN. I SEE THE MOD BY MY FRIEND'S INVITE. CAN I TRANSLATE IT INTO CHINESE? THANKS. YOU ARE REALLY KIND. I'm so glad to see your mod. it's really awesome. can i introduce this mod to korean community? the way convert json files to text files. sry for my bad english, I want you to know that i'm really appreciate to you. this is really great mod. thank you. Yes, you can introduce my mod however you like. I’m really happy that you like it, thank you. Sorry, I am not good at English and cannot explain it in detail. it's me again, really sorry to bothering you. first, we(me and korean moders) are really appreciate you and your mod. so... can we get some demo text files, If you still have? we can translate with your japanese(or english) text with google translator. mmm... The demo subtitles is marely a text, though it is a json file. The character encoding of the json is UTF-8(without BOM). Can you read Japanese text in the web browser without generating garbled character like □□□□? I uploaded the demo subtitles text(Japanese) as a web page to the URL below. I think that it would be good if you could read the text without garbled character. Sorry for my poor English, but thanks for readin.